Mark Dwight founder of Rickshaw Bagworks in San Francisco's Dogpatch neighborhood, explains his philosophy of making things locally. 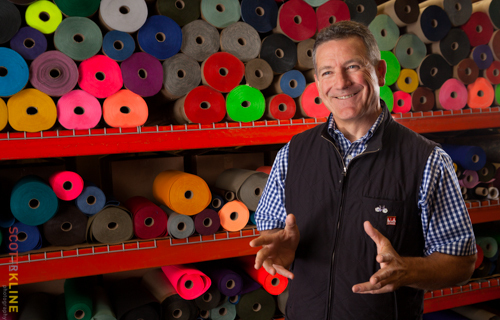 Behind him are rolls of the material used for the many colorful bags they make. Mark Dwight, founder of Rickshaw Bagworks, a manufacturer of custom messenger bags of all sizes, rides his bike through the roll up door of his retail/manufacturing space and calls out to an employee not to miss lunch today -- it is a special lunch celebrating the company's sixth anniversary. 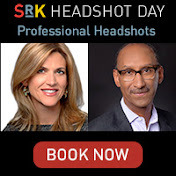 And he seems as energized and excited as if he were just launching the company. As he gives us a tour of his shop that serves as a major anchor of the Dogpatch neighborhood with its location at Minnesota and 22nd, it is clear that Dwight has managed to marry his finance, marketing and business savvy with his background in production to create not just a company that employs 20, but also to give a voice for local manufacturing in San Francisco. He is a founder of SFMade, an organization dedicated to supporting SF-based manufacturing and was appointed by Mayor Lee to serve on the SF Small Business Commission. 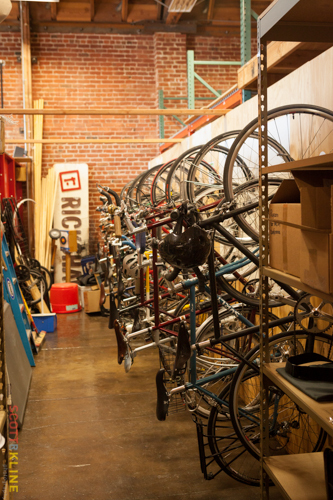 His commitment to the Toyota Way of continuous flow manufacturing is evident on the manufacturing floor and the fact that Rickshaw outsources to five companies within a bike ride's distance from their offices emphasizes Dwight's commitment to other local SF companies. But the Toyota Way doesn't just mean continuous improvement in manufacturing but also indicates a commitment to innovation, long term vision and respect for the people involved in the process and as such Dwight is a true evangelist. 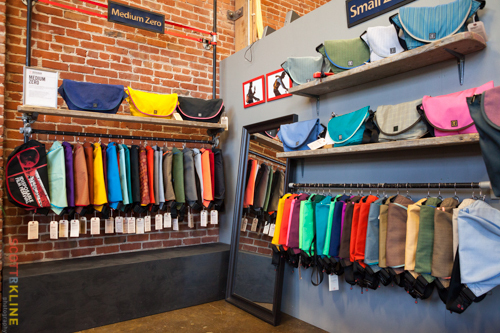 Some of the bags produced at Rickshaw sell in the company store in the manufacturing facility on 22nd Street in Dogpatch. The store is their only brick and morter retail location. I love to make things. My dad was an entrepreneur so I was exposed to that way of thinking but even more than that I was always obsessed with making things. When I was a teenager my parents bought a house that needed a lot of restoration. There was a craftsman they hired that worked to replace the stained glass windows in the house. I became fascinated by his work and learned all I could from him. I like to say that I used to work with colored glass and lead and now I work with colored fabric and thread! I spent 18 years in Silicon Valley working for various technology companies and even considered becoming a venture capitalist but couldn't stand not being hands-on, literally, with a company's products. 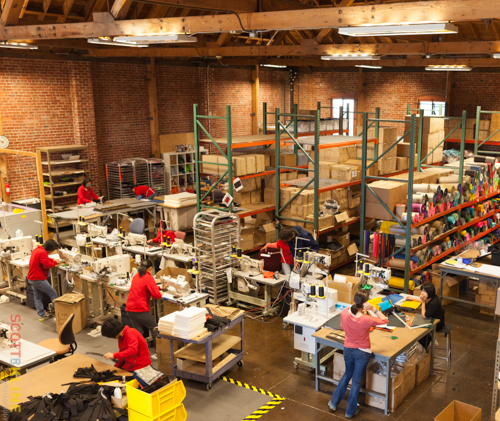 At Rickshaw we did the reverse of what some companies do as they grow -- we used manufacturing in China for some of our bags to get started with the goal of bringing all manufacturing back to SF as we grew. After all, sustainability starts at the bottom line, we wouldn't have a company story to tell if we were out of business! We know that we live in a global economy but many people don't realize that there is still a big overhead cost in working with China for manufacturing. So a key business goal for Rickshaw in 2013 is that we will completely stop using manufacturing facilities in China. We will either make the product here in SF or will discontinue the product if we can't make it here in a profitable way. I'm committed to minimal design and lean manufacturing -- make simple, elegant products and make them fast. Our sewers are craftspeople, an industrial sewing machine is like a race car, you need to have special skills and a mastery of the technology. I don't differentiate my work from my play -- I love the community of it and the feeling of a small group with a common purpose. The "parking lot" where Rickshaw employees, most of whom commute by bicycle, park their rides. When I decided to start this company I wanted an office and manufacturing facility that would be a bike ride away from where I lived in SF. I was riding around and saw this building that we are in now. And honestly, I had never even heard of Dogpatch at the time. The previous tenant had literally just moved out. I looked in the windows and it was love at first sight -- it was a big open space with no pillars. I loved the brick and the timber. It was just beautiful. There was a "for lease" sign in the window and I immediately called right then and there and it was ours. I then fell in love with the pioneering spirit of this neighborhood. In some ways the folks that live and work here are refugees as well as pioneers -- refugees from the overwhelming intensity of the core of San Francisco. 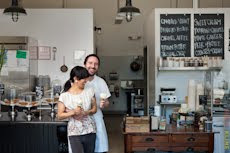 In Dogpatch they have the space to do the work they love. Joel Benson, the owner of Dependable Letterpress. He is a real craftsman. It was a long time goal of mine to use letterpress for our business cards. I finally was able to realize this goal but the local company I was using then went out of business. I had seen Joel's work when he produced notebooks with a bicycle design on them for a pop-up event for SFMade one year -- he is a letterpress nerd! We are lucky to have him nearby in the American Industrial Building. I would still be making something. If not bags, then something else. I like to say that I want to make a living and not a killing so I would find something else where I could get my hands dirty and make it happen. The manufacturing floor at the factory in Dogpatch.